PITAGORA ensures very high output featuring continuous cycle operations. The rotating carousel brings the brush throughout the 3 working stations: drilling, filling, trimming and loading/off-loading. The loading area provides also an electronically controlled trimming unit, capable of shaping the brushes according to different profiles. The machine may also be equipped for the production of disc brushes and lag brushes upon special request. PITAGORA is equipped e-STROKE filling head. The e-STROKE version allows to adjust the stroke of the machine at a variety of speeds, maximizing production speed (RPM) based upon fiber length in the brush. PITAGORA features also X-TOOL filling tools ensuring higher performances. 3-station carrousel machine: drilling; filling; trimming e loading/unloading. 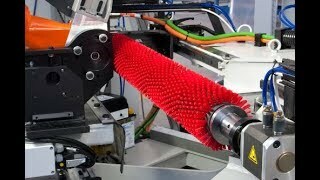 Continuous production of cylinder brushes up to 1200mm in length.